Light (in general) is made of electromagnetic waves (radiation). The electromagnetic radiation which we see is called "visible" light. 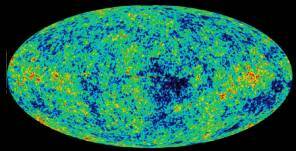 Going from Gamma rays, X-rays, UV, Visible light, IR, millimetric to radio waves, the electromagnetic radiation is divided into spectral regions. Fraunhofer spectrum of solar light. Wavelengths are in angströms (Å). Line C is Hα of hydrogen. The wavelengths of light are longer than 0.38 micrometer, (3800 Å, blue light) and shorter than 0.76 micrometer (7600Å, red light). For a musician the ratio (1:2) of these boundary wavelengths (or frequencies) is one octave. 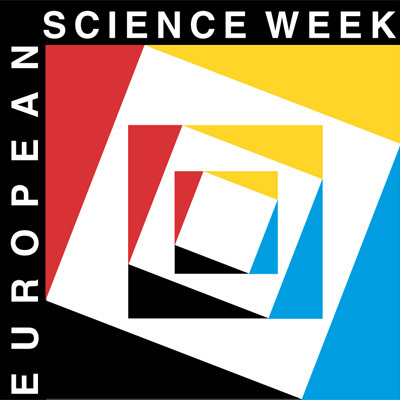 Our eye perceives thus one octave of electromagnetic oscillations. The 0.5 micrometer radiation has green colour. A series of two thousand waves of green light is one millimeter long. Shorter waves than 3800 Å down to 900 Å are UV radiation and longer waves than 7600 Å (up to 0.1mm) are IR radiation. Photons are small packets of energy, which oscillate with frequency ν. Their velocity in vacuum is c = 300 000 km per second. In a transparent medium the velociy is smaller. The energy of photons is hν. h is Planck's constant 6.6 x 10 -34 J s.
Radiation of only one wavelength is called monochromatic. Example is H-α line of hydrogen. White light consists of enormous number of different monochromatic radiations. 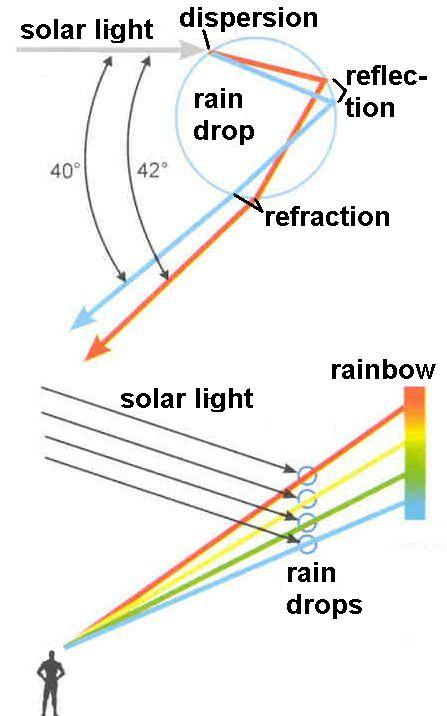 Rain drops spread out solar light into a rainbow - an unsharp spectrum. A grating produces a detailed spectrum. 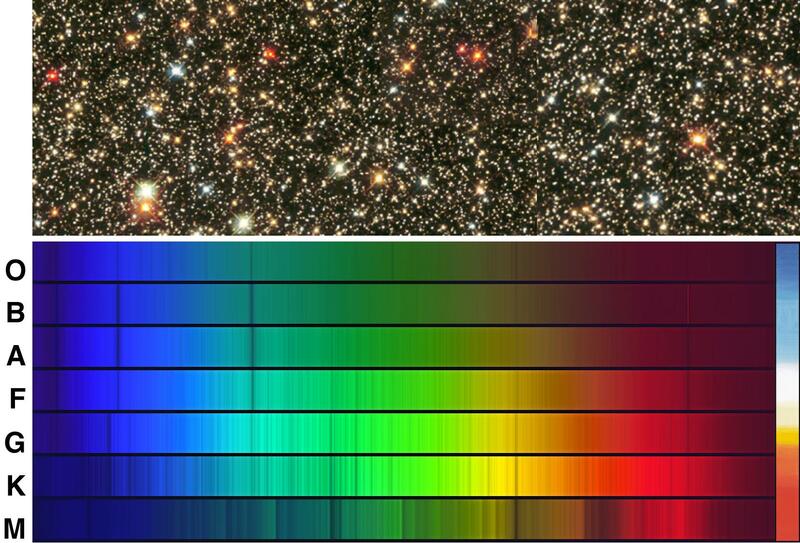 The colour of a star (in the star cluster) indicates only whether it is hot (blue) or cool (red). 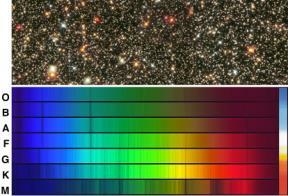 The detailed spectrum of a star gives exact information not only on its temperature, but also on other properties (e.g. chemical composition). Until the middle of the twentieth century, visible light was the only source of information on the Universe. 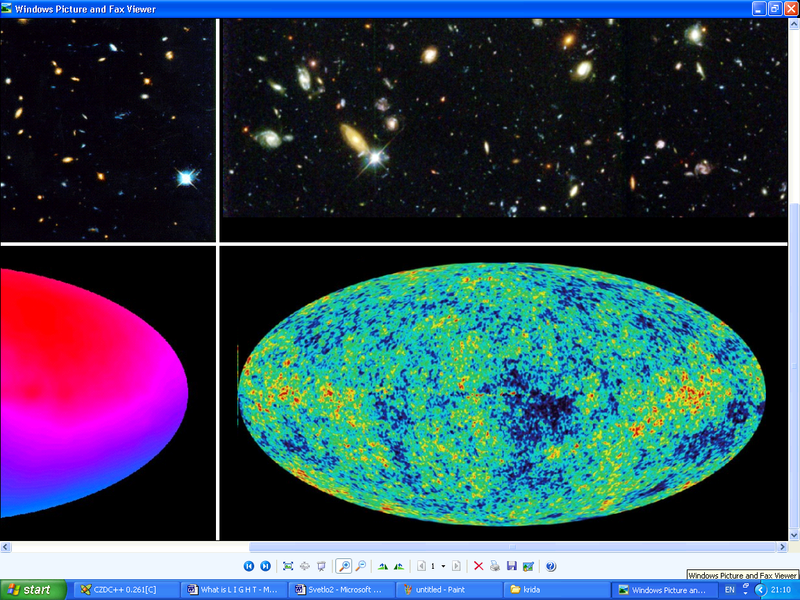 Today, telescopes with ingenious detectors placed on satellites and space probes show us the Universe in all the spectral regions from gamma rays to radio waves. Windows to the Universe have been opened from one octave to 92 octaves. 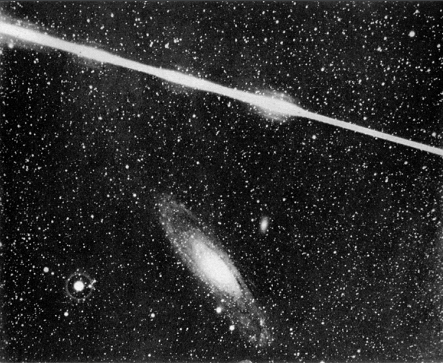 The nearest and the most distant sources visible with naked eye: a fireball and the Andromeda galaxy (J. Kleperta, Ondrejov 1923). The light from the fireball is one millisecond old. On the contrary, light left the Andromeda galaxy two and a half million years ago. 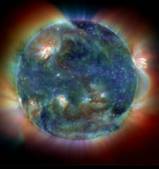 We receive all the energy we need as visible light from our star - the Sun. It is essential for all the life on the Earth. 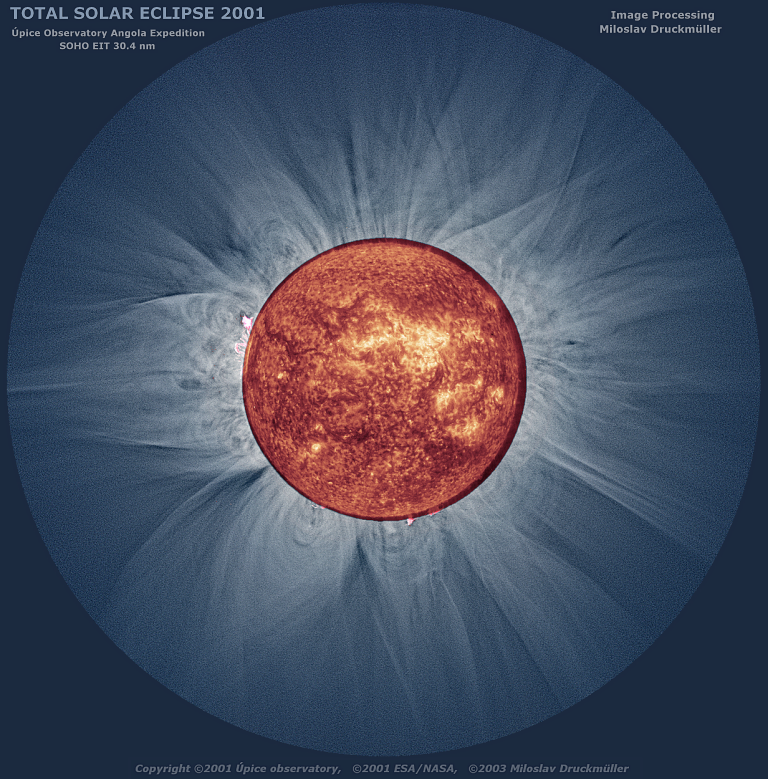 The total energy offered by the Sun to the Earth each second is 180 000 terawatts. By comparison: according to the UN statistics, the whole of humanity consumes 13 terawatts in industry, traffic, at home, in agriculture. We use dirty sources (coal, oil, natural gas) to cover our energy needs. These sources contain also solar energy - solar light accumulated by photosynthesis millions years ago. They are expensive, exhaustible, pollute our planet and gready people wage wars to get them. Have we forgotten the ideal safe thermonuclear reactor on the sky? We neglect the generous solar gift, which is of high quality (= efficiently transformable into any useful form of energy - as heat, electricity, chemical energy). It is absolutely clean (no pollution), eternal (for next 7 milliards years), many thousand times surpassing the needs of humanity, and is free for everyone.